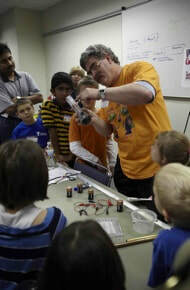 Cool Science often visits local libraries, museums, festivals, and parent/student activity nights to present fun and engaging hands-on science Activity Tables. We set up several activities that surround a common scientific topic (such as electric charges or the science of sound), and have a myriad of activities you can choose. Activity tables are a great venue for interacting with students one on one- the student can ask any question that might arise, and we are able to tune our explanations to their age level. Activity Tables can take as little or as much time as the child wants, depending on how interested and involved they become. Directed Activities typically require more time and focus than our activity stations. One or two Cool Science volunteers will lead a group of students, often as a team, to complete the project. Directed activities involve engineering or creating something that, once completed, demonstrates a scientific concept in a fun way. Projects also typically involve creativity and problem solving to both understand the concept and optimize the finished product. We have a variety of fun topics, and can develop new ones to meet your needs. Examples include: CD balloon hovercrafts; boomerangs; simple electric motors; super-hydrophobic surfaces (Water Marbles); siphons & water pressure; 3-D stereo photography; hoopster gliders; baby diaper dissection and polymers; slime & silly putty; dry ice; milk chemistry (including ice cream and Dippin' Dots); film canister rockets; Oobleck; paint blot fractals; Mobius Strips; marbling with shaving cream; candy chromatography; iron in cereal; giant soap bubbles; pin-hole cameras; gum-drop towers; mini catapults; Cartesian divers; tongue depressor harmonicas; airbrush painting; and many more. We add new projects constantly. Generally speaking, Directed Activities deal with a topic qualitatively while our Workshops take a more quantitative or experimental approach (dictated by the age of the students). Many of the Directed Activities listed above can also be presented as laboratory workshops (for example students might experiment with changing the standard recipe), as well as others like our hugely popular Rocket Chemistry workshop, Crime Scene Investigation, Bungee Barbie, Cabbage Juice pH and Chicken Foot Dissection. Cool Science often presents these for Saturday or Summer camps, scout troops and other groups, including regularly scheduled workshops for Girl Scouts at the US Air Force Academy and Colorado College. As always, limited financial aid is available, so don't worry about the prices above. To request or discuss any of these hands-on activities, contact us.